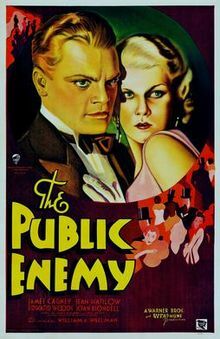 ~ THE PUBLIC ENEMY – A 1931 pre-code crime film produced and distributed by Warner Brothers. It was directed by William Wellman, and starred James Cagney, Jean Harlow, and Joan Blondell. The movie relates a young man’s rise and fall in the criminal underworld in Prohibition-era urban America. The screenplay is based on a never-published novel by two former street thugs — Beer and Blood by John Bright and Kubec Glasmon — who had personally witnessed Al Capone’s murderous gang rivalries in Chicago. The flick included a controversial scene in which James Cagney angrily smashed a grapefruit into his girlfriend’s face. The actress was played by Mae Clarke. ~ LITTLE CAESAR – This was another Warner Brothers 1931 pre-code film. Directed by Mervyn LeRoy, it starred Edward G. Robinson and Douglas Fairbanks Jr. The story was adapted by Francis Edward Faragoh, Robert N. Lee, Robert Lord, and Darryl F. Zanuck from a published novel by William R. Burnett. 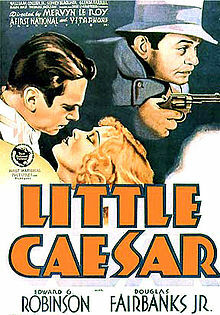 Little Caesar was Robinson’s breakthrough role; it made him a star. The last line in this celluloid classic is considered one of the great finale’s. Robinson says before his character dies: Mother of mercy, is this the end of Rico? ~ SCARFACE – The original 1932 motion pictures featured Paul Muni and George Raft. It was produced and directed by Howard Hawks and Richard Rosson; written by Ben Hecht; and based on the 1929 novel of the same name by Armitage Trail. The film also featured Ann Dvorak and Boris Karloff. One of a number of pre-Code crime films, it centers on gang warfare and police intervention when rival gangs fight over control of a city. The movie was loosely based upon the life of Al Capone. 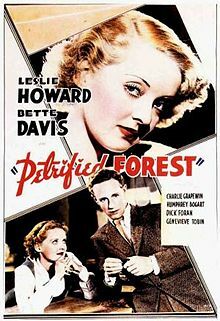 ~ THE PETRIFIED FOREST – This was a 1936 motion picture starring Leslie Howard, Bette Davis, and Humphrey Bogart. A precursor of film noir, it was adapted from a stage play by Robert E. Sherwood. He based his Duke Mantee character on John Dillinger, the notorious criminal who was named the first Public Enemy #1 by J. Edgar Hoover; and in 1934, he was ambushed and gunned down in spectacular fashion by FBI agents. 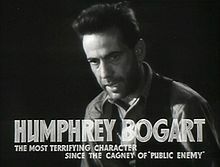 Bogart, who won the stage role in part because of his physical resemblance to Dillinger, studied film footage of the gangster, and mimicked his mannerisms in his portrayal. For the film, Warner Brothers intended to cast the more bankable Edward G. Robinson as Duke; but Howard informed Jack Warner that he would not appear in the movie version without Bogart as his co-star. The studio relented to the casting. Bogie’s performance led to roles in Dead End, Angel’s With Dirty Faces, The Roaring Twenties, and High Sierra. James Gandolfini’s Tony Soprano has an impressive spot in Hollywood history. This entry was posted on Thursday, June 20th, 2013 at 1:19 am	and is filed under Blog by Manny Pacheco. You can follow any comments to this post through the RSS 2.0 feed. Responses are currently closed, but you can trackback from your own site.